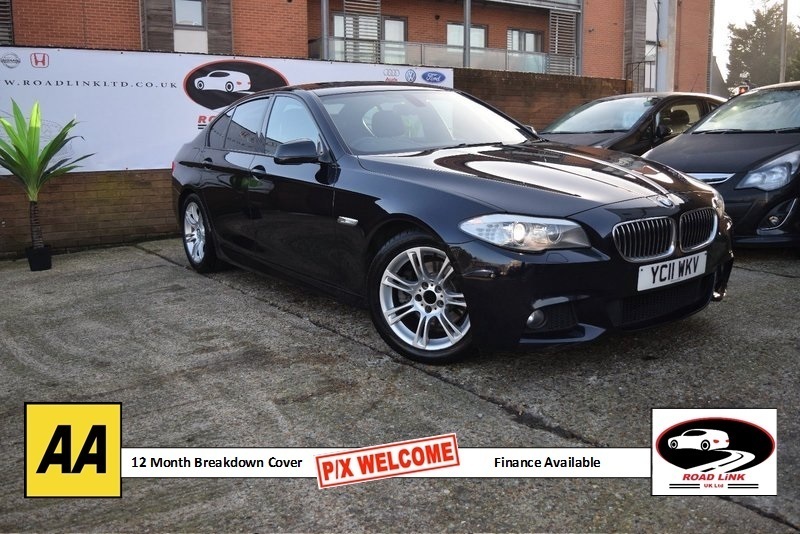 BMW 5 SERIES 520d M SPORT 2.0 Diesel. This Vehicle comes with Service History, long MOT, 3 Months Warranty and 12 months AA Breakdown Cover. At Road Link, all of our cars are HPI clear. Vehicle Specs: ABS, Air Conditioning, Alloy Wheels, CD Player, Central Locking, Climate Control, Electric Windows, Power Assisted Steering, Front Airbags, Side Impact Airbags, Adjustable Steering, Bluetooth, Cruise Control, Electric Mirrors, Leather Seats, MP3, Parking Sensors, Particule Filter, Radio Safety, Belts, Safety Belts, Rear Traction Control, 1 Owner, MOT, V5 Registration Document, Speed Limiter, Start Stop System, Body Coloured Bumpers, Cup Holders, Tinted Glass, Speakers, Steering Wheel Controls, Service History, ISOFix Anchor Point, Front Fog Lights, Brake Assist. At Road Link, we ensure that all of our vehicles are in perfect working condition, and will work continuously to ensure that we meet our customers end needs and requirements. If you wish to receive further information on any of our vehicles, do not hesitate to contact us on 0208 848 3221 or via Email.